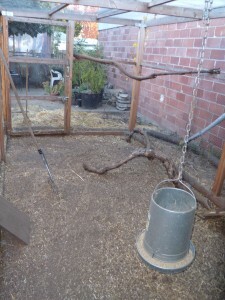 We decided early on to use the “deep litter method” in our chicken coop. 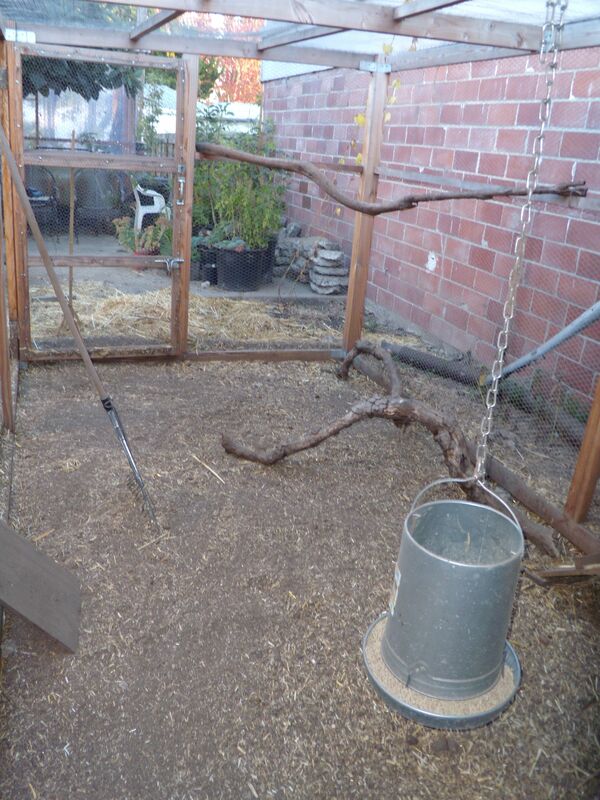 We didn’t want to spend our time scraping chicken poop off a hardpan dirt floor. The girls have seemed to enjoy their straw floor (though they’re terrified when we move the straw around), and we sprinkle in more whenever things start to smell. It really hasn’t smelled, and we feel our deep litter experiment has been a great success. Though people generally do a thorough cleaning once a year in deep litter chicken coops, late May (the anniversary of the chicken’s coop move-in) came and went, and we just didn’t get around to it. We are really busy and kind of lazy, so if something doesn’t obviously need doing, we don’t always get around to it. Yesterday I had a positively heavenly day of poking around in the garden—the first such day in months. For most of the day, it was ADD gardening: I wandered around pulling weeds as they caught my eye, sweeping paths, and lying down between beds to watch the sky and enjoy the unseasonable warmth. In the late afternoon, I realized I should apply myself toward mucking out the coop. An hour and a half and seven full wheelbarrows later, I was hungry, cranky, sorry for myself, and finished cleaning the coop. Rather than refill with fresh straw, Kelly and I took advantage of a bin of newly raked leaves, provided by our fabulous neighbors. We are excited to try this straw alternative for several reasons. First, leaves are free; second, they bring more insect life into the coop for the girls to enjoy; and third, these leaves are organic. We have yet to find organic straw, and shudder to think what herbicides the girls (and the soil) are exposed to. Here’s to another year of deep litter! Petunia–always one to keep us in line. I raked up the old straw and carted across the garden in a wheelbarrow. As the coop looked when I’d finished raking. 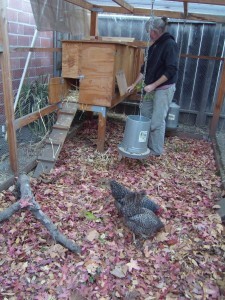 The chickens were so flustered by the raking process that Kelly took them out for a supervised walk in the garden. The girls explore their new turf. We will see how the leaves perform compared with he straw. This entry was posted in Chickens, In the Garden. Bookmark the permalink. Plenty to enjoy digging over that’s for sure and knowing how much my chooks enjoy investigating fallen leaves in my garden I’m sure your girls will love their fresh area. Well worth all that hard work! They seem to be enjoying it so far, Jackie. 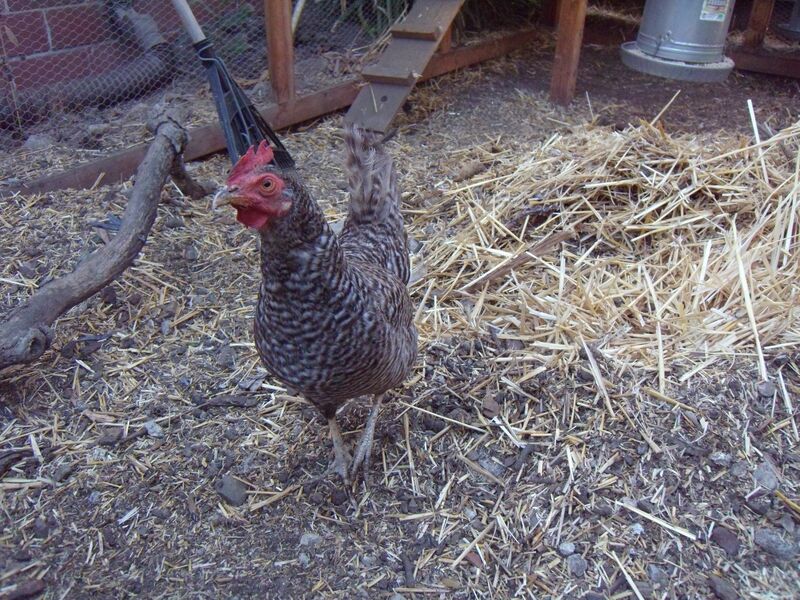 Funnily enough, Petunia, our barred leghorn, started molting abruptly just a few days after the change. I’ll assume this is a coincidence, but boy is it dramatic. How do you keep your coop? It could have been the sight of all those scattered autumn leaves that reminded Petunia it was time to shed a few feathers but you’ve got to feel for them when they lose their coats just as the temperature falls haven’t you. My chooks have an ark with house and small run but spend all of their time in the garden or, if raining, in what I call their bus shelter ~ a covered area with perch which they love! They then make their own way into their house at dusk. Dust extracted wood shavings on a layer of newspaper are replaced weekly in the house area with a handful of Fuller’s earth tossed around as due to our climate we have to watch out for red mite which love warm, damp conditions and the earth apparently suffocates them. It seems to work! Before I retired I used the principle of in when I’m out and out when I’m in for the girls to be allowed their freedom to roam but my garden has become Fort Knox in order to keep foxes out after an attack back in June so hopefully they’re safe. Poppy, my New Hampshire Red shouts loudly at any intruder so I take that as an alarm to go and check what’s going on! Yes, whatever the trigger, Petunia certainly got going with her molt awfully quickly. I envy you being able to let your chicken stun free every day; I’m sure they love it. They don’t decimate your garden without supervision? Or does Fort Knox protect against snacking chickens as well? Have you tried using rice hulls? I got my first chickens five years ago from the Mosquito Vector Control District. They came and set up the large chain-link coop (like a big dog kennel) and provided me with all the equipment and food, etc. for 10 poulets that started laying within 2 weeks, then they came out every other week and bled them for antibody testing from April thru October. 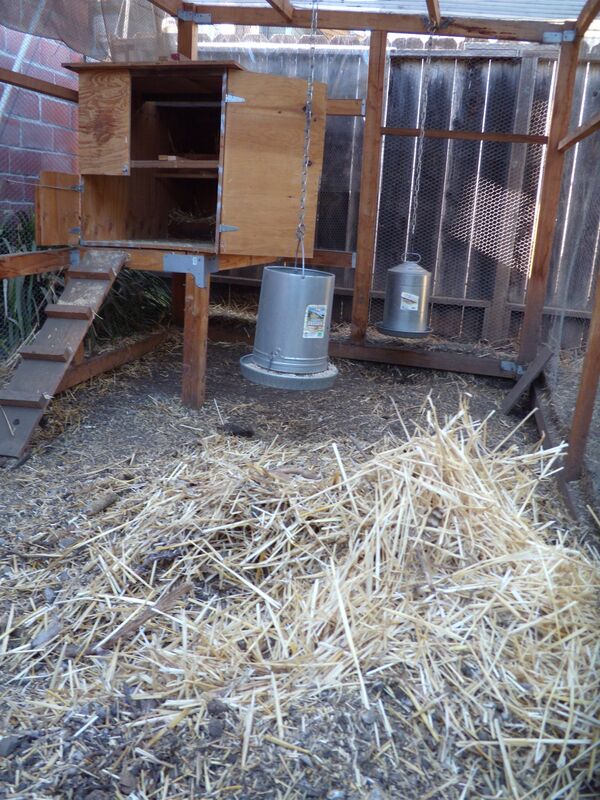 They have always used the rice hulls in the nesting boxes and on the floor. They are very easy to clean up and refresh. Also, as I’ve evolved as a farmer and become a soil-ninny, they are great to mix with dead leaves & food waste for rich compost. Hi Nancy–Thanks for stopping by our blog! Thanks also for your rice hull recommendation. Where do you find them, and how quickly do you go through them? We’ve continued using straw in the nest box, but would love to transition to something organic (and can’t find a source for organic straw). I too love to compost, and would be curious to experiment with rice hulls. I’m so intrigued that the Mosquito Vector Control District set you up with chickens, a coop, the whole works! Why were they interested in chickens, and what antibodies were they testing for? Typed a reply a couple of weeks ago and then lost the bloomin’ thing but finally back to try again! Currently viewing my chooks through the window sunbathing even though it’s close to freezing outside and yes, doing their best to dig a dust bath and in the process bury a few primroses but on the whole there’s not too much damage done. Since the fox attack I’ve only one large bird, the others being a couple of medium sized Wyandottes, 2 small Belgian D’Anvres and my neurotic New Hampshire red so apart from decimating the flowers on my naturalised geraniums and stripping berries off the Leycesteria bushes the rest of the garden survives… just! Nice to hear what breeds you have. I maintain my position, Jackie, that you should start a blog! You don’t mention the chickens getting into your vegetables. Are all the edibles at the allotment? A blog is still out of the question I’m afraid since my computer remains way down my list of priorities due to time restrictions. The majority of fruit and veggies is grown at the allotment about a mile away on the other side of the village but rhubarb, gooseberries and asparagus grow behind temporary fencing that the bantams love to squeeze through in spite of my efforts but being small they don’t do too much damage. My plan is to move my beehives on to that piece of ground during the winter months to allow myself easier access but even that won’t put the chooks off going in there. My cat Boris is the only creature to run and hide each time I put my smock on! Understandable. Blogs can be a bit of a time sink. Nice to hear more about the particulars of your garden. Boris must have learned a painful lesson!